Romney concedes: Ryan and I "left everything on the field"
Saying goodbye to a nearly six-year run for the White House, Mitt Romney early Wednesday morning conceded the presidential race to President Obama, thanking a room full of disappointed supporters near his Boston, Mass., headquarters for their devotion to his failed bid. He and his running mate Rep. Paul Ryan, R-Wis., "left everything on the field," Romney said, adding "we have given our all to this campaign." "I so wish that I had been able to fulfill your hopes to lead the country in a different direction," Romney said in remarks that began an hour and a half after CBS News called the election for President Obama, and lasted only a few minutes. "But the nation chose another leader. So Ann and I join with you to earnestly pray for him and for this great nation." With a projected win in the battleground of Ohio, the president arrived at the necessary 270 electoral votes relatively early on in what was largely expected to be a long night. Romney, who lost the 2008 primary to Sen. John McCain, called Mr. Obama to congratulate him shortly before taking the stage with his wife Ann, five sons, grandchildren, and the Ryan family. 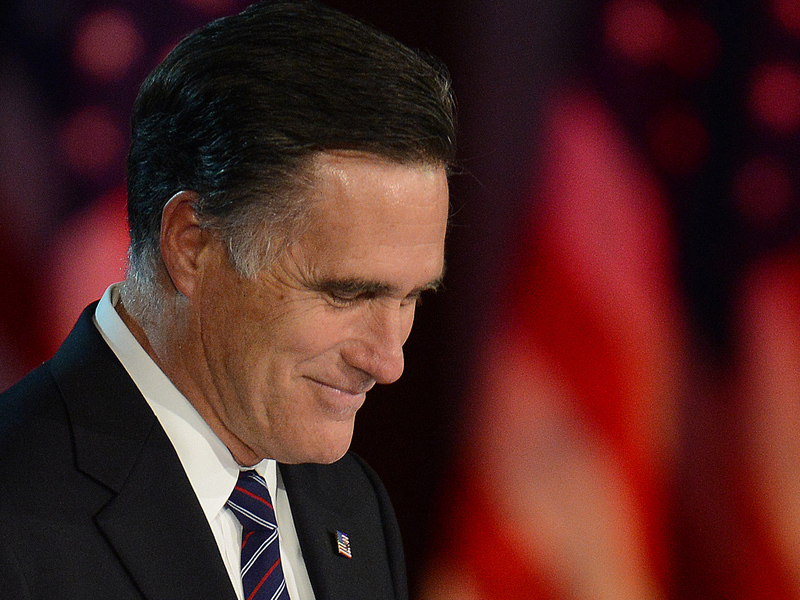 Reprising a line from the stump, Romney said his pick of Ryan was, "besides my wife Ann," the "best choice I ever made." He added of Ryan, seen as a rising star in the GOP who may consider a bid himself in 2016: "I trust that his intellect and his hard work and his commitment to principle will continue to contribute to the good of our nation." "The nation, as you know, is at a critical point. At a time like this we can't risk partisan bickering and political posturing," Romney said, eliciting the night's most enthusiastic cheer from his discouraged audience, which had fallen silent as returns trickled in through the evening. "Our leaders have to reach across the aisle to do the permanent work; we citizens also have to rise to the occasion." Central America: How will U.S. pot votes affect us? After thanking everyone from his donors to his surrogates to his senior adviser Matt Rhoades, Romney ended his brief remarks - which he had said he hadn't prepared earlier on Tuesday - on as positive a note as he could muster. "I ran for office because I'm concerned about America," he said. "This election is over, but our principles endure. I believe that the principles upon which this nation was founded are the only sure guide to resurgent economy, and to a new greatness."